To put that in perspective, the total franchise sales of the “Halo” game series since 2001 is somewhere over 50 million units, an impressive feat in itself considering it’s Xbox only (whilst Creed is cross-platform). The designers behind the upcoming survival horror game based on Ridley Scott’s “Alien” have previous spoken in interviews about their plans to adopt a “lo-fi sci-fi” approach here. That means though it’s set in a future on a spaceship, the game isn’t going to display anything more distinctly ‘modern’ looking than what could’ve been built for the original 1979 film. That means CRT screens, chunky buttons, primitive computer graphics, etc. Now, the studio has released a featurette discussing this aesthetic choice and it’s geek-tastic. One of the biggest advancements in gaming recently has been Epic’s release of Unreal Engine 4 and one of its aspects called “dynamic global illumination tech”. 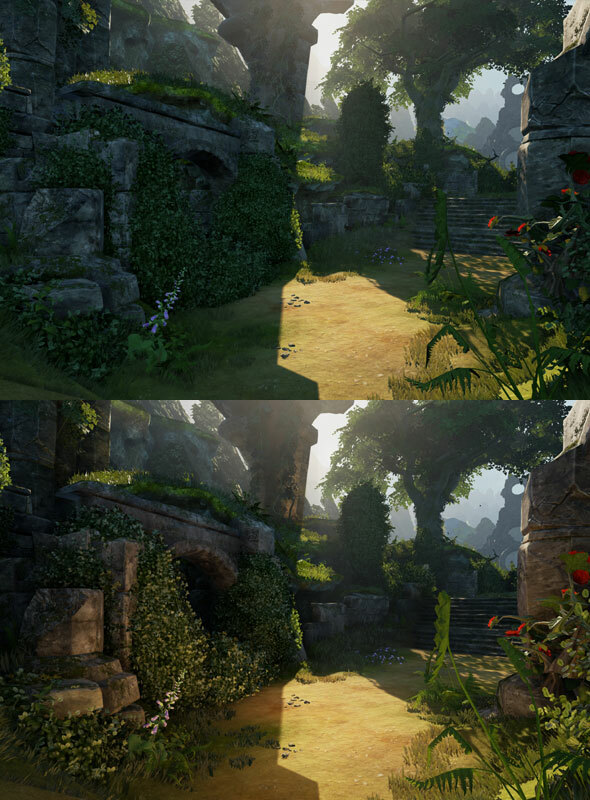 Lionhead can now visually demonstrate it in this shot from “Fable Legends” which uses “dynamic GI” lighting. The top shot is without it, the bottom is with the tech employed.